For the past two years, I have observed a crow migration route near my mother's assisted living home in Rockville MD. 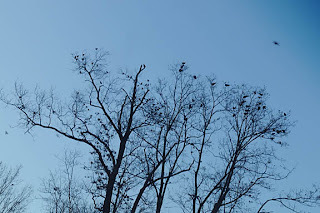 Just before dusk at this time of year, crows mass in trees to roost, and wheel about raucously overhead. 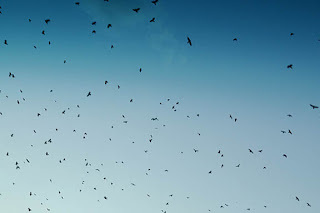 Interestingly, a mass of crows is termed a "murder." I have been deeply moved over the years by Masahisa Fukase's beautiful photographic poem in book form "The Solitude of Ravens." I learned just today that he has been in a coma for years, after a terrible fall. Here's to your great spirit sir. Yes Fukase was (is?) someone who, at least for me, communicated something words/song/poerty/et al. can't. I've been thinking of him and his photos more last few months as I've had the opportunity to go into b/w more than I've been able to in the last 20 years. If you read any of the books by Bernd Heinrich, you'll also learn that ravens are also among the most civilized and cultures (for lack of a better term) birds. They're not at all scary - they're smart, playful, faithful, and just well-adjusted! But they also represent something that people hate - freedom, self-identity, disinterest in mindless groups, ingenuity. Ravens are great, I am glad to live where there are a lot of them brightening my life! They're also a lot harder to photograph than you'd think - they're the smartest of birds - as I've found. Beautiful.